Nancy Luce, also known as the chicken lady, will be celebrated by the museum. Nancy Luce was born at home in West Tisbury on August 23, 1814, the only child of Philip Luce and Anne Manter. “She was a bit of a loner,” said John Alley, superintendent of the West Tisbury cemetery where Ms. Luce is buried. But a visit to her gravestone won’t reveal that. 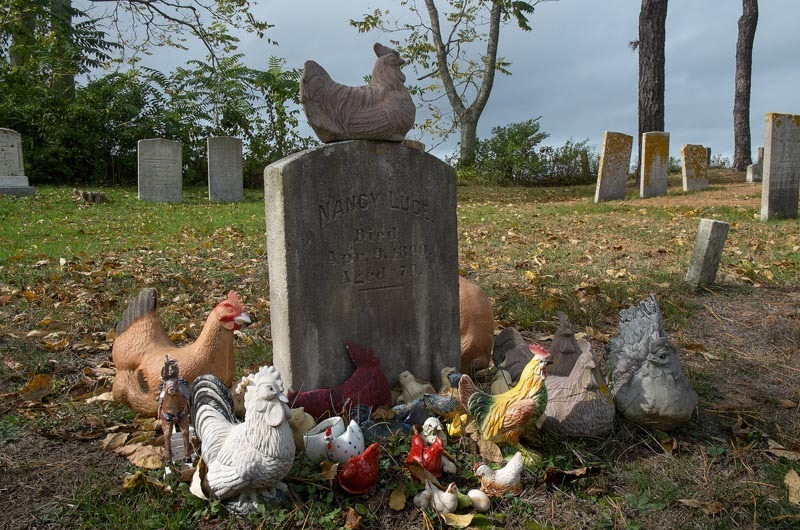 Today, her marble gravestone is decorated with chickens of all sizes and colors, although Mr. Alley said he isn’t sure when or why the tradition started. On Sunday, Oct. 26, from noon to 2 p.m. the Martha’s Vineyard Museum is hosting a 200th birthday party for Ms. Luce at the Old Marine Hospital in Vineyard Haven. The museum is also featuring Ms. Luce in an upcoming exhibit opening on Nov. 7, entitled Nancy Luce: Madonna of the Hens. Ms. Luce died on April 9, 1890, and each year around that time the chickens around her grave begin to increase, even two centuries later. They also congregate around Halloween, but Mr. Alley said there is no reasonable explanation why. Nancy Luce lived her entire life at the farmhouse near the head of Tiah’s Cove in West Tisbury, and it was there that she cared for her parents and raised animals, mostly chickens. She was a folk artist, poet, businesswoman and writer, and some say the first female entrepreneur on the Island. “We don’t know much about her early life,” said Anne DuCharme, education director at the Martha’s Vineyard Museum. The museum has curated many of Nancy Luce’s letters, pictures and postcards, all of which will be on display in November. Tombstones that Ms. Luce made in remembrance of chickens who died are on display at the museum’s permanent exhibit. The names of the chickens are etched into the tombstones — Teeddla Toona, Levendy Ludandy and Otte Opheto, to name a few. The Brown University library is also home to many of Nancy Luce’s papers, which Walter Magnes Teller consulted to write a biography of Nancy Luce in 1984. 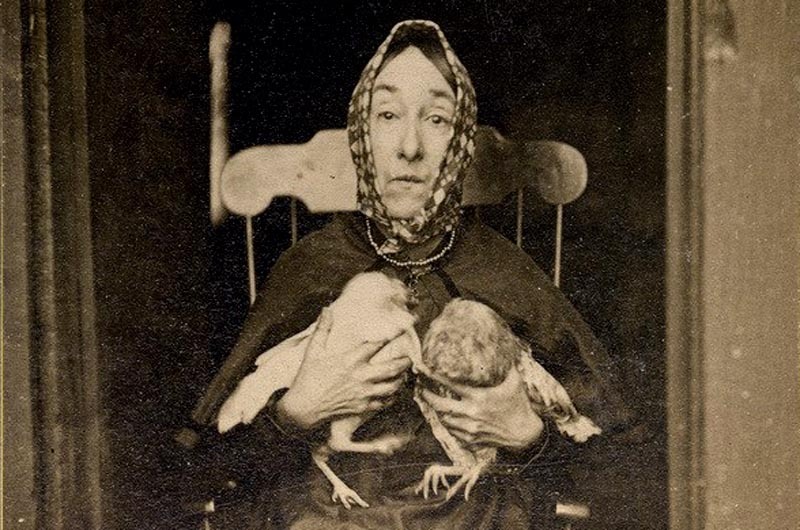 Chief curator of the Martha’s Vineyard Museum, Bonnie Stacy will share stories about the Chicken Lady during the opening reception. Ms. Luce was 27 when her mother died and 31 when her father died. It was then that she stopped riding horses and only tended to the animals on her farm, as these creatures, her writings reveal, were her only friends. One of her close friends, she wrote, was a three-legged cow named Red Cannon. According to archives in the Vineyard Gazette and the Dukes County Intelligencer, Ms. Luce preferred to be alone. When she became the object of mockery and ridicule for young boys who would harass both her and her chickens, she wrote letters to the newspaper pleading with the town to keep the young boys away from her. Ms. Luce ran a store on her property and her stock in trade came from bartering with a merchant in Edgartown. She traded hand-knit stockings, some she made herself from her own sheep’s wool, for tobacco, which she sold to neighbors. She also sold eggs from her chickens and little books she authored herself. West Tisbury resident Eleanor Neubert has been told that she may be related to Ms. Luce, but even among possible relatives the story is still murky. Cynthia Riggs, another West Tisbury resident, seems closest to the source, having heard stories as a child from people who actually knew Ms. Luce. “My great-grandfather knew her,” said Ms. Riggs. “My mother lived with her grandparents and so she shared all these stories with us about Nancy Luce. Apparently her home was a tourist stop. Tour buses would go past her house and she would sell her books there. And with the chickens, it’s hard to miss. “I think that it’s a common thing for Islanders to be different or eccentric, from the time of the whalers to the present,” said Ms. Riggs. A Halloween and 200th birthday party for Nancy Luce will take place Sunday, Oct. 26, from noon to 2 p.m. at the Martha’s Vineyard Museum’s Vineyard Haven property. There will also be an opening reception for Nancy Luce: Madonna of the Hens on Nov. 7 at the Martha’s Vineyard Museum in Edgartown from 5 to 7 p.m. This is a wonderful, whimsical story! Ms Luce sounds like a woman I would've like to have met! Sounds like she did her life "her way" - the Best way!! She is a distant relative. We were at the cemetery a few years ago to bury my mother and Johnnu showed us her tombstone. With chickens everywhere! A wonderful story, thanks! I'm pleased to see old Island history in the Gazette. And old Island eccentrics. True fabric of the people. Animals are wonderful. Thank you for this story! Greaat story but I am wondering how many tour buses there were in the 1880's? Nancy Luce was quite a poet and well ahead of her time, as Walter Teller points out in his biography. Contrary to popular style, she wrote in blank ("free") verse. The only other contemporary poet of note who was doing the same was a fellow from Brooklyn by the name of Walt Whitman. I wish someone would revive the musical that Linda Berg and I wrote about 10 years ago, called "Nancy Luce: The Musical". Island Theatre Workshop did it at the Sailing Camp. 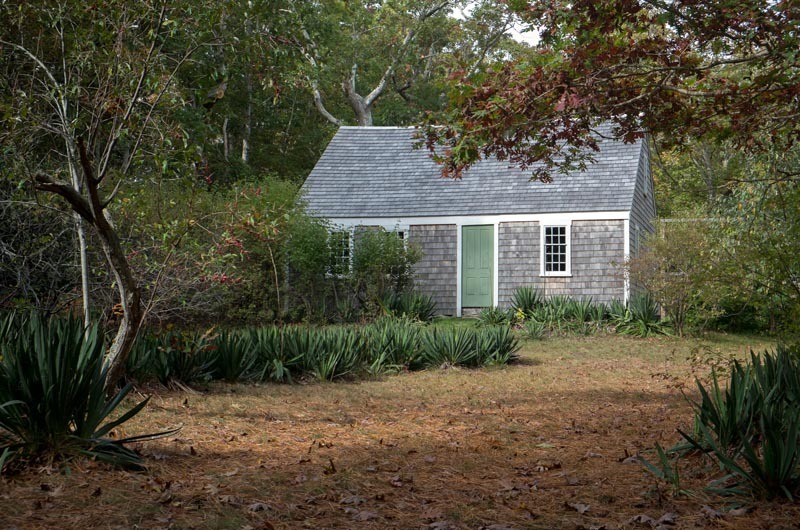 My mother, Mary Ann Hartigan lived in West Tisbury from 1986 until her passing in 2011. She was an animal lover like Miss Luce and a little eccentric also. I referred to her as "the bird lady of West Tisbury". She would feed the birds about 50 lbs. of seed a week. She saved table scraps for her crows and fed them nightly too. When the cats would catch baby bunnies, she would rescue them and take them over to the W. Tisbury cemetery and release them. I spread some of her ashes in that cemetery right near Miss Luce's grave. Every year at this time, I get to thinking about Nancy Luce.